Glendora Boland helped established Food First NL in 1998, as a Co-Chair of Dietitians of NL, the local action group of Dietitians of Canada that established FFNL to address concerns about the cost of healthy eating in NL. “Food First NL's extraordinary storytelling ability is a core strength of their communication success,” says Glendora Boland. 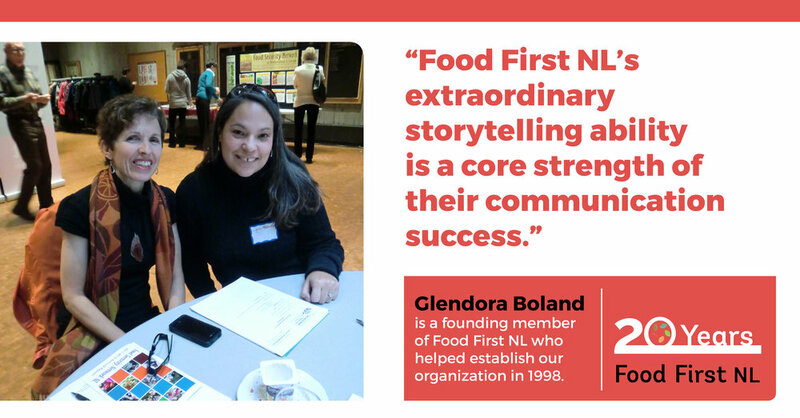 Glendora has been a part of Food First NL’s own story since the very beginning. 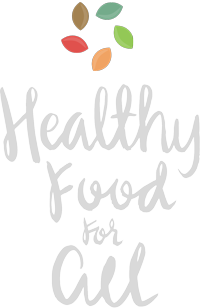 She helped establish Food First NL in 1998, as a Co-Chair of Dietitians of NL, a local action group of Dietitians of Canada, who established Food First NL to address concerns about the cost of healthy eating in NL. Through those conversations, Glendora met many others who shared her concerns about the cost of food in NL. Since those early days, more and more people and organizations have become a part of Food First NL’s story. She counts government authorities (both provincial and federal) and groups like the NL Public Health Association, the Kids Eat Smart Foundation, Recreation NL, Memorial University, and the Seniors Resource Centre among Food First NL’s associates and allies. With each new and continuing project, Food First NL’s gets stronger. Projects like the community-led food assessments on the North Coast of Labrador, the Everybody Eats discussion paper and regional forums, and Healthy Corner Stores NL are just a few of the projects Glendora points to as evidence of Food First NL success. As Food First NL moves into its next 20 years, Glendora believes that Food First NL must continue its collaborative work with key stakeholders to improve food policy at the municipal and provincial level.